Pacland's Philippine Boxing Forum • View topic - First Pinoy in the NBA - Kai Sotto? First Pinoy in the NBA - Kai Sotto? Post subject: Re: First Pinoy in the NBA - Kai Sotto? Kai Sotto - 1st Pinoy in the NBA? Time will tell... Who knows??? For a basketball-crazy nation, it's really too bad that we can't produce even one homegrown NBA player. I really hope Kai is the one. If Kai is really that good then it doesnt really matter. makukuha yan if he really deserve it. dahil nasa 7'2 na ata ngayon at me talent naman. I really hope he stops growing now. 7'2" is already good. Very tall players seem to have lots of health issues. Yao Ming had problems with his knees. Gonzaga University is talking about him.. The key there is the word play. if he goes to the US. its not a guarantee that he will play. in fact 100% of our cager get 'bangko-ed' in the US. Kobe was not good enough to get playing time at Creighton when he got there...Creighton was loaded with senior players when Kobe was a frosh. MANILA, Philippines — An NBA and FIBA certified agent has been pursuing 7-1 Kai Sotto for three months, trying to persuade his father Ervin to send the 16-year-old wunderkind to the Spanish premier division club Real Madrid on a $1 Million, five-year contract. Sotto drew a lot of interest from scouts and agents when he played for the Philippines at the FIBA U17 World Cup in Argentina last July. He averaged 16.4 points, 10.6 rebounds and 28.9 minutes in seven games, hitting 47.2 percent from the field and 67.4 percent from the line. Batang Gilas finished No. 13 of 16. Last April, Sotto averaged 16.8 points and 13.5 rebounds as the Philippines wound up No. 4 of 8 at the FIBA U16 Asia Cup in China. Sotto kept busy by averaging 12.7 points and 8.7 rebounds for the Philippines at the FIBA U18 Asia Cup in Thailand last month. No doubt, Sotto has the upside to become a major player in the international circuit. The agent’s idea is for Sotto to follow in the footsteps of Slovenia’s Luka Doncic and Latvia’s Kristaps Porzingis who both signed with Spanish clubs as teenagers then matured to join the NBA as first round draft picks. Doncic was 13 when he was recruited by Real Madrid and at 16, started to play in the Liga Endesa or Liga ACB (Asociacion de Clubs de Baloncesto). At 19, the 6-6 forward became the NBA’s third overall draft pick this year and will now play for the Dallas Mavericks. Porzingis was 15 when he joined Sevilla in the Liga ACB and 20 when he was the New York Knicks’ first round pick and fourth overall in the 2015 draft. Other NBA players who went the Spanish route as teenagers were Congo’s Bismack Biyombo and Spain’s Hernangomez brothers Willy and Juancho. Aside from Real Madrid, two other Liga ACB and two LEB (Liga Espanola de Baloncesto) Oro clubs inquired about Sotto’s availability. Liga ACB is Spain’s premier division while LEB Oro is the second division. In Europe, the usual practice is to recruit teenagers within the formative years of 16-19 to begin training with premier division clubs. Charlotte’s Tony Parker, formerly with San Antonio, turned pro at 17 in the French league then was drafted by the Spurs in the first round at 19 in 2001. There is enough Filipino-rooted influence in the NBA to welcome Sotto when the time comes. Former PBA import Dell Demps is the general manager of the New Orleans Pelicans whose international scout Yarone Arbel was recently in Macau evaluating talent at the Terrific 12 tournament. Former TNT coach Bill Bayno is an assistant coach with the Indiana Pacers. Former TNT coaching consultant Maz Trakh is an assistant coach with the Washington Wizards. Former PBA TV analyst Jim Kelly is a scout with the Mavericks. Jama Mahlalela, who spent several years conducting Jr. NBA camps in Manila, is head coach of the Toronto farm affiliate Raptors 905 in the NBA G-League. Fil-Am Erik Spoelstra is the Miami Heat head coach and Fil-Am Jordan Clarkson plays for the Cleveland Cavaliers. Another option for Sotto to consider is enrolling in an NCAA Division I school in the US. There is talk that at least two schools are checking on Sotto. One is Gonzaga University where John Stockton played and the other is the University of Southern California where DeMar DeRozan and Nikola Vucevic saw action. Sotto also has the option of staying at Ateneo where he is now the star of the Eaglets varsity and eventually, moving to the senior division. FOUR European clubs are eyeing to secure the services of UAAP Season 81 Juniors Most Valuable Player Kai Sotto of the Ateneo Blue Eaglets. Real Madrid, Barcelona, and Baskonia in Spain, as well as Alba Berlin in Germany have tendered their offers to the 17-year-old to make a move to Europe, according to a report by Sportando. The report cited that Sotto is looking to make a move to Europe to further develop his game against a higher level of competition. Real Madrid has earlier been rumored as one of the pursuers for the 7-foot-2 wunderkind's services, among other offers from United States and Australia. Sotto has been on a league of his own this past UAAP Season 81, norming 25.1 points, 13.9 rebounds, 3.4 assists and 2.6 blocks in Ateneo's runner-up finish. He has not denied on the possibility of him taking his act overseas, admitting that there are indeed offers, yet he refused to give details on his future plans. Spin.ph reached out to Sotto's father Ervin, but the patriarch opted to remain mum on the situation. CHICAGO - In this world we now live in, where technology has magically narrowed down the oceans, it's become evidently clear that wunderkind Kai Sotto could no longer hide from the prying eyes of the NBA's global scouting community. Four weeks after Dallas Mavericks owner Mark Cuban acknowledged knowing about Sotto, but couldn't expound on it because of tampering rules, another high-profile NBA executive told SPIN.ph on Tuesday that the 16-year old gem is indeed on the radar. This time, though, the declaration was unrestrained, the praise unabashed. Moments after Sacramento gored the Bulls, 108-89, on Tuesday at the United Center, I asked Kings GM Vlalde Divac: "I know you scout for players all over the world, have you heard of this kid from the Philippines, Kai Sotto?" Without taking even a second to pause and reflect, Divac quickly replied, "Yes. Yes, I did." Divac used to be the head of basketball operations and consultant for Real Madrid, so I told him about the team's reported five-year $1 million offer to Sotto and wondered what his thoughts were on the rangy seven-footer. "I saw some films. I think he's very talented, yeah. It's very important for him to stay focused and work on his game. The money, if you're good, it's gonna come," added Divac, who served two four-year terms as president of Serbia's Olympic Committee beginning in 2009. Sotto's discovery isn't about whispers, loose lips, and word of mouth. Sotto has actually been exposed through a diligent vetting process NBA franchises implement in search of the next big thing. Austin Ainge. the son of Celttics GM Danny Ainge and Boston's director of player personnel and scouting, said it best when he told Bleacher Report in a June 2016 interview. "it usually starts with the junior national teams. Under-16, under-18, we are following box scores, watching film and attending some of those. You start to see who the best players are from each country. There are some guys that don't end up playing on those teams, but most of the best players make their country's Under-18 teams. That's where it starts." Scouts viewed you from the prism of physical tools, skill, vision, competitive fire, and basketball IQ. You must have enough of each or all of those traits for Real Madrid to come offering a generous bounty. So, what are you waiting for, young man? Carpe Deim. Seize the day. Don't let the ink on that contract offer dry. Dreams, like money, never sleeps. Real Madrid, like time, doesn't wait. They will find someone else, just as easily as they found you. Change is hard and the fear of the unknown is real. But there is nothing more dark and scary than the thought of spending the rest of your life wondering "what if?" When you come to think of it Kai, there is no downside here. Those who insist that you stay at Ateneo only have their own interests at heart. Those who think that money isn't paramount are mostly those who don't have it and therefore can't appreciate what it means to have financial freedom. As any overseas Filipino worker will tell you, a five-year contract worth $1 million is a heck of a deal. Unlike the typical OFW, though, you're not just toiling for a livelihood, you will be on a noble quest to become the first full-bloodied Filipino to make the NBA. Brush up on your Spanish, Kai, and go to Real Madrid. A small step for you could potentially be a giant leap for Filipinos. MANILA — Kai Sotto was named the top high school player of the Philippines for the second straight year by the National Basketball Training Center. As announced on Tuesday, the seven-foot-two center from Ateneo de Manila High School headlined this year's "NBTC 24", hailing the best juniors players in the land. However, just as the current Batang Gilas beanpole solidified his stature as the future of Philippine basketball, four teams from Europe reportedly offered him a contract to join them. Liga Endesa outfits Real Madrid, Barcelona, and Baskonia, and the Basketball Bundesliga side Alba Berlin, all Euroleague strongholds, have expressed their desire to acquire Sotto. kai has a gift of height and wingspan that japet, kobe, and ray doesnt have. without a major injury hell be the first filipino to be drafted in the nba. Hopefully, and wish he would succeed if drafted just like my look-alike Luka Doncic. IT'S only a matter of time before Kai Sotto makes one of the biggest decisions in his budding basketball career. 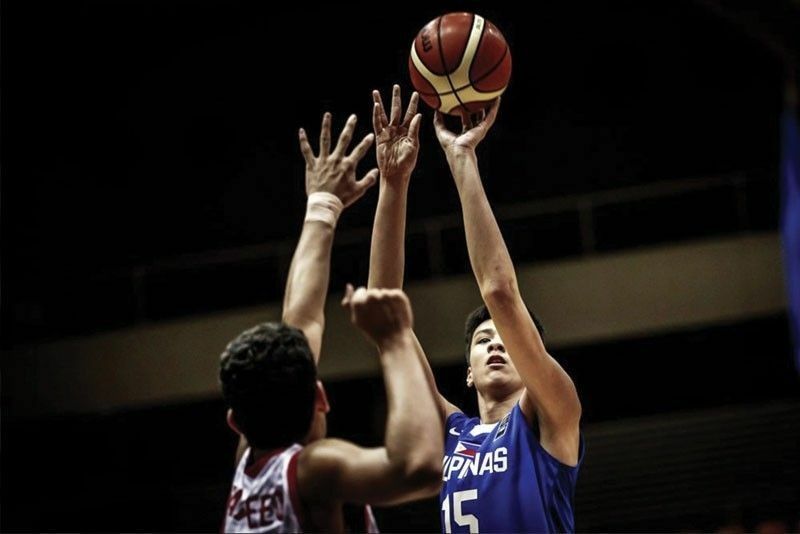 As offers from European teams continue to come in, the 7-foot-2 prodigy of Ateneo's high school team bared that it won't take long before he decides on his next move. "Siguro before NBTC or after. Basta this summer, hindi mahirap na mag-decide ako," the 17-year-old said. Aside from Real Madrid, Barcelona, and Baskonia in Spain, and Alba Berlin in Germany, Sotto said Spanish club Estudiantes has also signified its intention to sign him up. Sotto assured he will make the decision in consultation with his family. "Yung tatay ko naman, sinasabi naman niya lahat at open siya sa akin. Talagang transparent siya. Kaya ako, more of nagtatanong lang ako sa kanya at umu-oo o hindi lang ako sa kanya. Magde-decide kami siguro ngayong summer," he said. The UAAP Season 81 Juniors MVP said he couldn't be anymore grateful for the attention he's getting from these foreign squads this early in his career after showing what he can do in his three years with the Ateneo Blue Eaglets. "Syempre wine-welcome ko naman yung mga offers nila para sa akin. Di ko naman yun binabalewala kasi alam ko naman na para sa akin din 'yun at makakatulong din yun sa akin. Talagang pag-iisipan muna namin ng mabuti kung ano yung magiging decision namin bago kami mag-decide," he said. Asked what would be the biggest factor in his decision, Sotto said it would boil down to which club can offer him the best for his individual development - one which he hopes could lead him to becoming the first homegrown Filipino player to play in the NBA. "Yung development ko as a player ang pinakaimportante kasi pwede namang hindi ako pumili ng club pero magte-train lang ako sa kanila," he said. "Ang importante lang naman sa akin is mag-improve ako, magpagaling at magpalakas pa lalo dahil yung goal ko talaga is mag-NBA. Gagawin ko yung lahat para makapunta doon."